The Guesthouse Vienna is situated in the heart of Vienna, just a 5-minute walk from Saint Stephen's Cathedral and next to the Albertina Museum. It offers an individual atmosphere and amenities like free WiFi and a bakery on site. This design hotel features modern, air-conditioned rooms with high-class furniture, a Bang & Olufsen TV and audio system, a living area, and a bathroom with a shower. The rooms on the upper floors have views of the State Opera and the city centre. A concierge service is available. 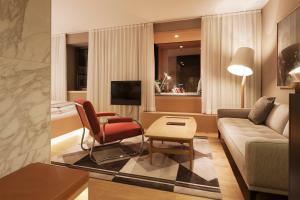 Four bottles of Austrian wine, beer, non-alcoholic drinks, tea and coffee are provided in each room free of charge. The brasserie and bakery on the ground floor of the house serves light, healthy dishes and freshly baked bread and sweets. An à la carte breakfast is available all day. The Guesthouse Vienna enjoys a central location, only a 3-minute walk from the State Opera and the Karlsplatz Underground Station, and a 5-minute walk from the Burggarten Park and the Heldenplatz Square. For special occasions, dresses and accessories can be rented online from local premium designers and delivered directly to the hotel room.